Just like the Royal Mission 3-Door Hutch, the 2-Door hutch is an exquisite demonstration of the Amish Mission style. The modest lines of the Mission style bring balance to your home, while the stunning solid hardwood provides a warm, inviting charm. 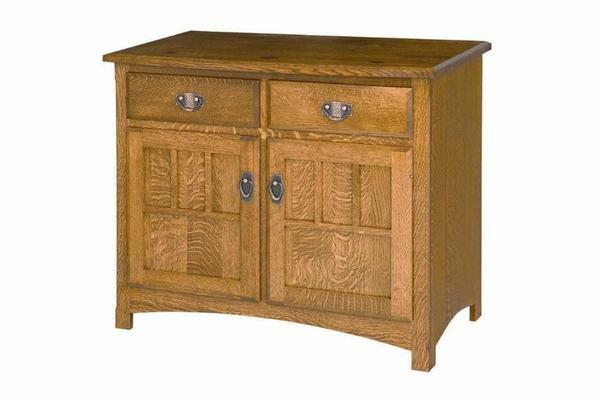 Available in your choice of 6 beautiful hardwoods, you can customize this buffet to perfectly fit your home and style. The Royal Mission Buffet is functional in nearly every room of a house. Store table settings in the dining room, liquor or wine in the bar, even store towels and cosmetics in the bathroom. With the beautiful hardwood and gentle Mission curves, the Royal Mission Buffet looks brilliant in any room! Call us today with any questions at 1-866-272-6773 or to get an order started. If you are in Florida, please plan a visit over to our Amish furniture store.